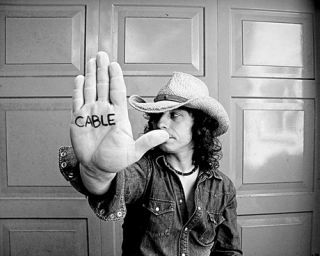 Rhythm is sad to report the unexpected passing of Stuart Cable. The former Stereophonics drummer was found dead at his home in South Wales earlier this morning. The cause of death has not yet been revealed, although police are not thought to be treating the circumstances as suspicious. His mother Mabel told WalesOnline: "Stuart has travelled all over the world with the band and I have worried myself silly. "He is now settled down and then this has happens. It has not sunk in yet." Cable, who had been due to play Download Festival this weekend with new band Killing For Company, shot to fame as livewire sticksman for indie superstars Stereophonics. The band's rapid ascent to fame saw their debut album Word Gets Around hit the Top Ten of the UK charts. Commercial success was also followed by critical acclaim as they bagged a Brit for Best New Group. Stuart and the rest of the 'Phonics took the difficult second record in their stride, with Performance And Cocktails hitting top spot and spawning hit singles 'The Bartender And The Thief', 'Pick A Part That's New' and 'Just Looking'. Follow-up Just Enough Education To Perform saw Stuart and the boys well and truly become mainstream megastars, hitting Number One and sticking around the top 100 for more than two years. He parted ways with the band in 2003, going on to forge a media career and release his typically forthright, humorous and compelling autobiography - Demons and Cocktails - last year. As an always entertaining showman, and a damn fine drummer, Stuart will be a much missed member of the drumming community. Leave you own tributes to Stuart below.